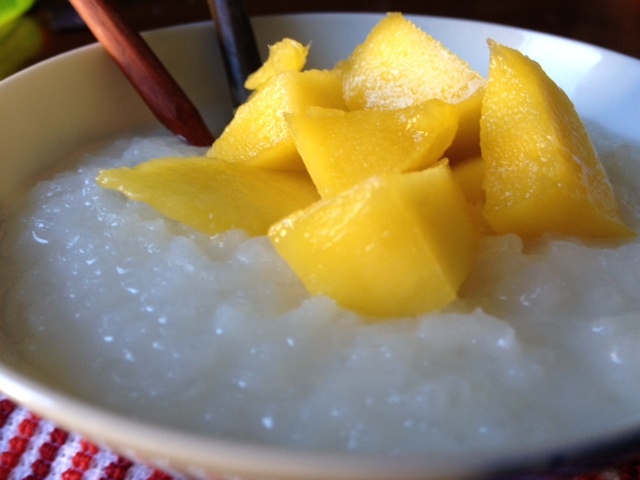 I love mango sticky rice. 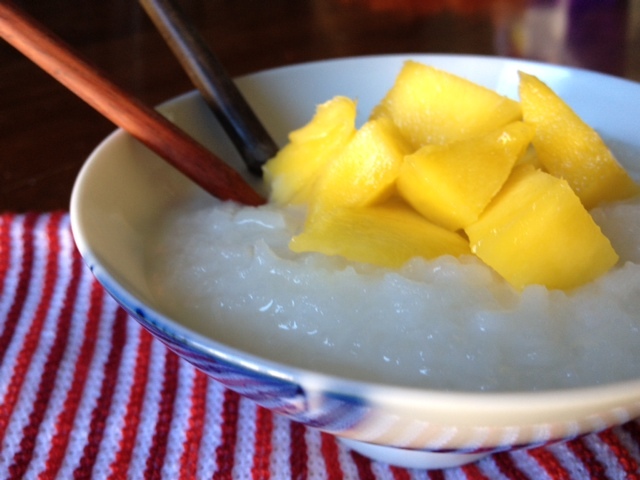 Let me rephrase that…I LOVE MANGO STICKY RICE!!! I’ve got 2 versions of this scrumptious dessert (I use the term ‘dessert’ very loosely, because I eat it for every meal until its gone). One is a little more complex and takes a few extra ingredients – but it’s totally worth it. However, there are days where I just don’t have half of that stuff 🙂 so I have the cheater version too. But the cheater version is almost just as good! Only the teeniest, tiniest of difference (which means that I make the cheater version more often :)). If mangoes are out of season, you can substitute with bananas and/or pineapples. Soak the sweet rice in 1 cup of water for 20 minutes, up to 1 hour. When done soaking, add 3/4 cup more water, plus 1/4 can coconut milk, 1/4 tsp salt, 1 tsp coconut flavoring, and 1 Tbsp brown sugar. Stir this into the rice. Cook in rice cooker or over stove top. Warm the rest of the can of coconut milk together with 1/4 cup sugar, pinch of salt, 1 tsp coconut flavoring, and 1 tsp vanilla over medium heat. Add cornstarch mixture (dissolved in water) to the sauce and stir to thicken slightly. As it thickens, turn heat down to low. Remove from heat when thickened. Pour sauce over cooked rice and mix completely. Allow to sit for a few minutes to let the rice absorb the sauce. Serve immediately with sliced mangos. Cook rice as directed on bag/box (can cook on stove top or in a rice maker). Meanwhile, in a small saucepan, combine coconut milk, sugar, and salt. Boil for 3 minutes, stirring frequently. Remove from heat. Add the hot coconut milk sauce to the cooked rice. Stir until mixed. Slice mangos and top rice. Serve immediately.